Starbucks, a premier brand of coffee is headquartered at Seattle, US and led by Howard Schultz. The company roasts, markets and sells premium coffee globally. STARBUCKS (NASDAQ: SBUX) was formed in 1985 and is operating across 75 countries. The coffee chain is known best for its premium quality coffee. However, apart from that, it is well known for excellent customer service and excellent stores that offer stress free environment for customers. Starbucks is extraordinary in several other regards as well. It also aims to become one of the most respected and recognised global brand. To achieve its objectives, the company has focused on disciplined expansion in several key markets including developed and fast developing markets. It has also focused on the optimization of its licensed and owned store base. Starbucks purchases and roasts high quality coffee which it sells along with hand roasted coffee, tea and other beverages. As of October 2017 there were total 27,339 stores operational worldwide. Out of these more than 16,500 were operational across the Americas. The company has managed an optimum balance of licensed and owned stores globally. Apart from these things, the company is also known as an ethical business. It sources its cocoa ethically from selected suppliers. The company also maintains its focus on high ethical standards inside the organisation. 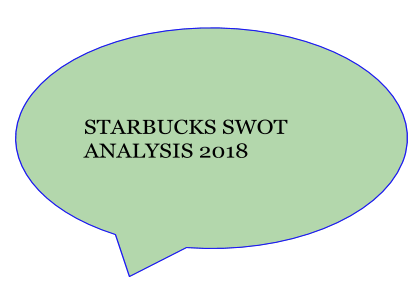 Read more about Starbucks in this SWOT analysis. Starbucks has maintained a strong brand image as an ethical business brand. Apart from its premium products, the company is known for being customer centric. The main focus of Starbucks remains on highest customer satisfaction. However, the company does not compromise on ethics. It has formed set firm rules related to work ethics. It has formed the image of a premium brand supported by good quality customer service. If the brand is a favourite of millions around the world, the reason is its dedication to customer satisfaction. A strong brand image is a critical strength which helps businesses in several areas. Apart from higher sales and revenue it also reduces marketing costs and helps businesses achieve faster growth as in the case of Starbucks corporation. Starbucks sources only premium quality coffee from the best producers. Its Arabica beans are very different from the regular Arabica beans and the company goes to great lengths to ensure that it sources only the best. Best quality beans are found at higher altitudes. To source the best Arabica coffee Starbucks has formed deep rooted relationships with coffee farmers. Apart from picking cherries when they are at their peak, the brand also roasts them deeper to bring out the best taste which can be felt in each cup of coffee. Everyday experts at Starbucks taste thousands of cups to ensure that only the perfect taste reaches the customers. Starbucks is a global brand selling its products across 75 countries. It sources its cocoa from several corners of the world. Americas are its main market and the brand earns a very large part of its revenue from the American markets including US and Canada. However, apart form America, it is also focusing on growing its business in the fast developing markets like China and India. The geographical segments that its business is divided into include Americas, CAP and EMEA. The Americas include United States, Canada & Latin America. CAP means the China and Asia Pacific markets. EMEA includes Europe, Middle East and Africa. Starbucks has the highest number of stores in Americas followed by China and Asia Pacific. Starbucks enjoys very high level of customer loyalty. It has been able to build a strong image which has resulted in a large and loyal customer base. The main factors that have helped the brand achieve high level popularity and loyalty are its premium quality products and high standards of customer service as well as work ethics. Starbucks is in a financially strong position and the result is that it can invest in high quality raw materials and excellently designed stores to attract customers. Total net revenues of Starbucks reached 22.4 Billion dollars rising from 21.3 Billion dollars. Operating income of the brand saw a slight decline in 2017 falling from 4.17 Billion to 4.13 Billion. Traditionally, Starbucks has not spent much on marketing. It has mainly relied on word of mouth and publicity for marketing. In the recent years, Starbucks started spending on advertising and promotions. However, its marketing expenditure is still very low as compared to the other beverage brands. Its brand awareness and recognition could be even higher given it had focused on strategic marketing of its brand and products. The mobile technology is on the rise globally. Larger number of people are using it for shopping and payments. Starbucks too should focus on growing the use of mobile applications. This will also help the brand generate extra revenue and profits. The operational costs of Starbucks have kept rising every year. Apart form the cost of raw material, the cost of labor has also increased. Other costs like that of supply chain management are also adding to operational costs and leading to a decline in operating income. In 2017, the brand’s operational costs were higher than 83% of its total revenue. Focussing on international growth will reduce the company’s dependence on the US markets. In this regard the brand should grow its range of stores in emerging markets like China, India and Brazil. The large middle class population in these economies offers great growth opportunities for Starbucks and a chance to increase its customer base and market share. Local partnerships will also help the company find faster growth in these areas. Starbucks’ core product is coffee but it must also focus on teas and juices for faster growth. These products also offer good opportunities of sales growth. Tastes and preferences of consumers worldwide are changing and people want healthier options. The millenial generation is especially a very health conscious generation. Starbucks cam tailor its offerings to suit this generation’s taste. In the US market too, Starbucks must try tapping into the rural customer base. The brand has never invested much in marketing and promotions. In the last five years, since it started investing in advertising and promotions, its advertising expenditure has remained under half a billion. Starbucks can raise its investment in this area for growing its market share and customer base as well as sales and revenue faster. It must try to improve customer engagement and loyalty by investing in digital technology and AI. Tailored experiences can help it improve the level of customer experience. A large part of its customer segment uses mobile apps for purchases. Starbucks should focus on this area for more growth.